Let's start by defining a few terms. A router is a device that connects a number of devices together in a network, and routes data traffic between them. 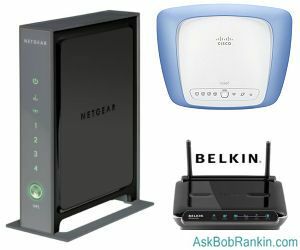 The only real difference between a wireless router and a standard network router (sometimes called an internet router) is that the wireless router has a radio antenna that can broadcast the same data that would otherwise travel over a network cable. A wireless router connects devices without wires, using radio signals transmitted between devices and the router. Most routers, especially the ones installed in homes and small businesses for high-speed Internet access, have the wireless feature. In fact, you might find it hard to purchase a network router that isn't also a wireless router. Even the earliest wireless routers supported broadband speeds of 1 Mbps or higher, so all WiFi routers are also wireless broadband routers. The latest and fastest standard is "Wireless N" (known also by it's technical name 802.11n) which supports speeds up to 600 Mbps. The Internet Service Provider controls the speed at which the local network can communicate with the Internet. That's much slower than 600 Mbps in virtually every home - typically somewhere between 1.5 and 30 Mbps. You'll also find Wireless G (802.11g) and perhaps even older 802.11b routers on the market. See my article on Wireless N Routers for help deciding which one is best for your needs. What Can You Do With a Wireless Router? Networking with wireless routers is very popular for several reasons. Home wireless Internet access is a snap, compared to the old-fashioned technique of running cables all over the house. In addition to getting your computers online, you can share files between computers, even share printers and other devices. Guests can bring their laptops and enjoy the Internet without carrying and plugging in cables. And of course, your home might be considered downright inhospitable without a wireless signal for all those iPhones, iPods, iPads and other smartphones that wander in. Wireless printers can be placed anywhere, unrestricted by the length of a cable. Wireless game consoles, keyboards, joysticks, etc., make wireless gaming as effortless as couch-surfing. WiFi routers can connect any WiFi devices that come within their radio signals' range. Wireless internet routers enable public WiFi "hot spots," areas in which you can connect to the Internet with a laptop or other wifi device. Coffee shops, book stores, and other locations may provide WiFi hot spots. WiFi for mobile devices is built into many phones, and other gadgets like the iPod Touch and iPad. This is handy for devices that cannot make a 3G cellular connection, or in places where the cell signal is weak. The downside is that you have to stay near a wifi hot spot or lose the Internet connection. Vendors of WiFi routers have jazzed up the basic functions of a wireless router in many ways. The Belkin Surf, Share, Play, Max family of WiFi routers, for example, includes basic WiFi networking; software that makes photo sharing easier; default settings optimized for gaming; and maximum-speed configuration for Wireless N, to the extent your local devices and Internet connection can keep up. Netgear's Wireless-N 300 WiFi router is a popular workhorse; inexpensive, reliable, and easily set up. It includes wireless parental controls, and a broadband usage meter for those unfortunate enough to pay for Internet access like it was water or electricity. The meter alerts you when your bill is getting too large. Cisco Systems is widely considered the Cadillac of networking equipment. Their Valet and Valet Plus wireless routers are designed to be intuitively obvious to set up. The Plus model has a second radio antenna and a Gigabit Ethernet hardwire connector; both enable faster Wireless N speeds. Most recent comments on "Wireless Internet Routers"
Lost the driver for sound on IBM computer running XP Professional. I have the cd for full XP but cannot find the driver on the cd. Can I get it online from Microsoft? Surprised you did not mention the importance of making one's wireless secure. We have a Fios router. How can we get it to get a stronger signal to work in our backyard? Thanx! I bought recently a wifi router LinkSys WRT120N. I was scared because software was a Windows one and I run Linux on my computer. So I simply connected the router and it worked fine, from the beginning, isolating me from the ADSL cable, as a bonus. Now I can use my laptops all over my house. But, I need a bridge between the router and my Brother laser printer. Any suggestion? Have a wireless router (inherited) password was set-how can I crack it or disable it? EDITOR'S NOTE: You'll need to press the reset button on the router, to reset it to factory defaults. Typically you'll do that put inserting the end of a paper clip into a little hole labelled RESET. Best router I have ever had, and I have had several over the years, is the apple airport exstream that I have. It gives me b/g and n in the house PLUS a separate b/g and n open network for guest that it keeps separate from the main net so no hacking is possible. I like it so much that I bought the airport express for the big screen in the living room, this unit plugs into an electrical outlet, connects to my network N and drops audio, network and usb connections. So I have a place to connect the t.v. with no wiring, connect my audio system for streaming music and have a usb port for connection ipod etc. They also have a model called the time capsule with a backup disk in the router. Never would have thought of apple for a router, if I had not visited there store for an ipod. I highly recommend. I pay $30 a month for DSL. Can i buy a wireless router and get onto the internet for free? I have an Apple computer. EDITOR'S NOTE: No, your router (whether you connect to it via wired or wireless) must have an Internet access source, such as DSL, cable, or fiber optic. You MIGHT be able to get free wireless access, if you live near a neighbor or business with unsecured wireless router. But I suggest you read this article first -- http://askbobrankin.com/is_free_wifi_illegal.html -- before going that route. Is there a way to extend the coverage area of my Wifi Router? I'd like to be able access it from the other side of my property. I have ATT DSL with a Gateway 2Wire router(wireless). They say that I MUST use this router brand. Is this true? Bob, I charged off to read this article as I just purchased my first wireless router... But you don't mention them at all. It is a router that connects to the cellular data network. I don't have access to DSL or cable. But this gives decent speeds and as the 4g network spreads these devices will become more common. Security is an interesting challenge as I'm not used to the router firewall being so unconfigurable but I expect that will change. Your item started from a reader's question about how to get wireless working on his laptop. I just thought I would mention that I have an HP laptop and it has a toggle button on it to turn wireless on and off. On my first road trip with the laptop I had to call home to my network specialist son-in-law to find this out. I'm interested in pre-paid or pay-as-you-go MiFi for a business continuity plan. Are there more options than Verizon since you wrote the article last august? EDITOR'S NOTE: Sprint also offers Mifi, but I don't think you'll find a pay-go plan for this. I sometimes wonder (and worry) about the RF signals sent by my router. There are increasing amounts of RF in the environment and my new wireless router can enable laptops all over the house. The router has no on/off switch. The techie says "don't worry" just keep it on all the time. Do you or does anyone else worry about the long term effects such wireless signals may have on our health?? Keeping it on all the time means that I am broadcasting a signal 24/7, day and night even when sleeping. Can I connect two wireless routers to one computer? So the only way I can get wifi if I have a computer with Wifi built in is to go to a Wifi Hotspot? Is there a way I can have it so I can get Wifi at home or do I have to have to have DSL? Help. EDITOR'S NOTE: You'll need to be near a wifi hotspot, or add an adapter to your computer that can use a cellular signal to provide Internet access. Check with your mobile phone provider for costs. My dekstop can't connect to d link my wireless router. What should I Do?